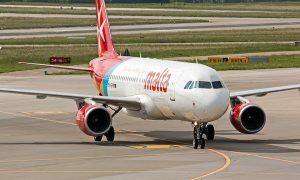 Air Malta’s results for the first half of the current financial year show the airline is on track to regaining profitability, with the company projecting a loss of just €4 million by March 2016. This was announced during Air Malta’s Annual General Meeting reporting the audited financials for the year ending March 2015, which, as projected, showed a loss of €16.4 million. Air Malta’s audited financials presented at the AGM for the year ending March 2015, showed a loss of €16.4 million. “This despite, the closure of the Libya route and the drop in the number of passengers from Russia, which contributed to a loss of circa €10 million, increased competition in summer 2014 and an airline with a virtually depleted management structure,” said Chairperson Ms Maria Micallef. The results of Financial Year ending March 2015 were also achieved thanks to the renegotiation of the catering contract, which gave savings of more than €4 million annually, and the sale of Selmun Palace Hotel Company Ltd.
“Results for the first six months of the current financial year confirm that the company is €8.7 million better off, from a profitability point of view, when compared to first six months of last year,” said Chairperson Maria Micallef during Air Malta’s Annual General Meeting. “If these positive trends continue – and if we do not experience any major setbacks such as natural disasters or industrial action in the next six months – we will exit the restructuring programme period with a loss of around €4 million,” she added. “We are now, finally, starting to reap the benefits of having the right contracts in place,” she said. Passenger and revenue figures for July 2015 were even higher than they were in July 2013 which had included substantial numbers from Libya. 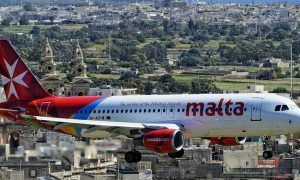 Malta’s national airline agreed on a restructuring plan with the EU when it was making a loss of €78 million, which demonstrates how far the company has come in a few short years since 2012. Ms Micallef said Air Malta had a diligent and professional workforce which now needed to increase its productivity by 25 per cent in some areas for the airline to compete with other airlines at par and not be left behind. She also underline the need to find a strategic partner. Ms Micallef emphasised that during the last six months of the Restructuring Plan all stakeholders must show how much they care about the airline.